Tomorrow marks the return of spring: the Vernal Equinox. I can't remember a March when it actually felt like spring, but here we are with no snow on the ground and birds by the thousands filling the skies. 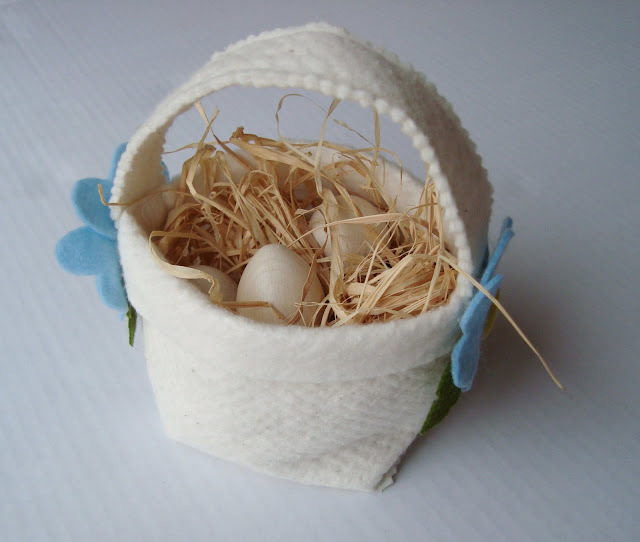 This little basket is adding a sunny touch to my daughter's room... filled with a raffia nest and wooden eggs from her play kitchen. It's the perfect craft for this first weekend in spring... quick and easy to whip up with only basic sewing skills needed. It would also make a great basket for Easter or a sweet little party favor container. I kept mine very simple, but you can think of these as little canvases to embellish with your own style. A recipe for you to interpret your own way... Make them out of any kind of felt. I used cotton batting, because I have so many scraps leftover from my burlap buckets... and it performs exactly like felt! I'm also fond of white. 5. 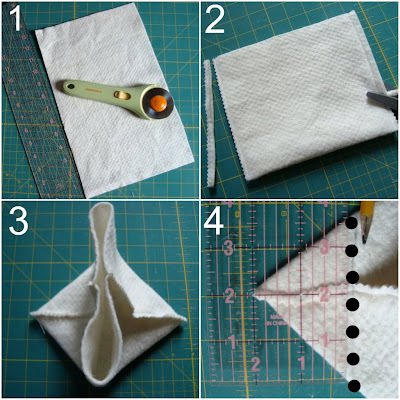 Make handle: fold 11x2 piece of felt in half the long way. Sew up each side with a 1/4 seam allowance. Trim excess with pinking shears. 7. Sew handle to the outside of basket directly over side seam. 8. Tack four flower petals and leaf together with a few hand stitches. 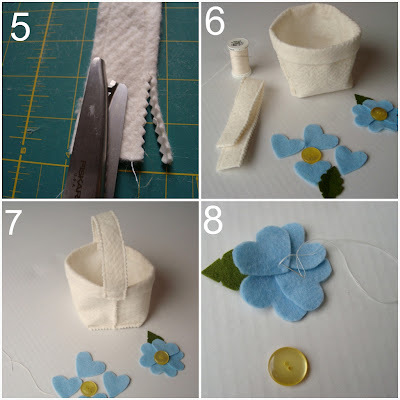 Attach flowers with buttons covering where the handle meets the basket. There are so many ways you can personalize these... covered in felt flowers, applique, embroidery, buttons... I'd love to hear how you create yours! And if you're a maker who doesn't sew... I have a basket just for you coming up. So sweet, Maya. Love the simplicity, as always. Oooh this is a nice little project for the weekend, I can see it with a couple of ducks eggs in as gifts! You are always my hero! Stupid as I was, I was looking in the stores to buy a new basket for eastern-eggs! But of course: I should make some myself! Thank you very much! Thanks for showing all the steps. They would make great little Easter gifts. 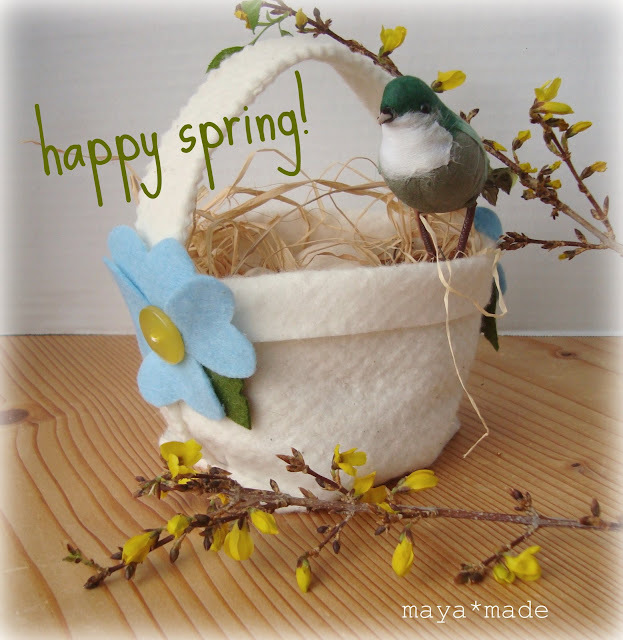 Have a wonderful beginnig of Spring! Maya, this is so sweet! Just yesterday I was looking for a gift bag and thought... hmmm, I'd rather have a basket of some sort and this would be perfect! Gorgeous! Perfect for my lil girl to go easter egg hunting with. Lovely basket, feels so natural and cozy. I laughed when I read your last line because I was already wondering if I could hot-glue this basket together. But really, I just need to find a space to keep my machine out at all times. Looking forward to your next project and thank you! Thank you SO much for this post Maya. I've been trawling the web looking for ideas for easter egg baskets for me nieces and this is perfect! Thank you so much for sharing! I was looking for a quick, easy easter basket idea for my girls. Now I found it! Cute idea, if I get around to crafting with the kids for Easter, we may do a version of this with glue. love the idea, it would be an easy thing to do for my 7yo. I linked to this from my blog; hope that's okay. That is super cute! Thanks for sharing the tutorial. Adorable. I love another excuse to sew box corners. They really jazz an item up! How darling! I'll be making two for my daughters. I just told my husband last night we need to buy Easter baskets -- but this is SO-O much better! Thanks!! What a beautiful post to return home to. I love the early spring we are having here. My fingers are crossed in hope that it lasts . This is a wonderful project. I like the way you used batting--great idea! Thanks. I love this idea! I recently discovered your wonderful blog--added it to my blog-roll. so sweet. your blog is so nice. thanks for sharing so much. Too cute! I posted some we made in a kids' sewing club at http://www.sewingschool.blogspot.com. Thanks for the inspiration! Aww, that's beautiful, I love it! I'll be linking. What a sweet little basket Maya!!! Love it! i set a link to this tutorial at my blog. Thank you so much!!! I just made this for my 1 year old little girl. It is the perfect size for her. so sweet and lovely, very spring, very girly. love it! A perfect basket for my softie Easter Buns. Thanks! Hi, thank you so much for your great instructions. I've used the idea to create this Hot Cross Bun basket. These are absolutely darling! Thanks so much for the tutorial! This is so cute, and looks simple enough even for me! How big does the basket end up being? I want to make one big enough to hold some little toys for my kids' Easter baskets.